Dominic Crossley, whose firm represented Max Mosley in his case against News of the World, has responded to comments made by Sir Christopher Meyer, chairman of the Press Complaints Commission (PCC), to a select committee for culture, media and sport last week. Meyer chose to ‘pour scorn’ on Mosley and not the News of the World, despite the fact that Mosley won his case and a breach of privacy was found in his favour, writes Crossley. “[I]nstead of criticising the News of the World or even warning those involved as to their future conduct (both the editor and journalist concerned remain in their roles), the chairman of the PCC reserves his scorn for Mosley. Meyer’s approach does nothing to relieve the perception that anyone seeking redress from a national newspaper is wasting his or her time by going to the PCC,” he says. This entry was posted in Editors' pick, Legal and tagged chairman, Christopher Meyer, dominic crossley, editor and journalist, lawyer, Max Mosley, News of the World, PCC, Press Complaints Commission, press standards, privacy, regulation, the News of the World, the Press Complaints Commission on April 1, 2009 by Laura Oliver. “It is always a pleasure to be in Manchester – a city with a vibrant media which I have visited more than any other in England during my time chairing the PCC. It was in this very room five years ago that I launched the first of our Open Days: public meetings in the towns and cities of the UK aimed at making the PCC as accessible as possible. Then, as now, we were given all possible support by the Manchester Evening News and Paul Horrocks. One of the most respected and innovative editors in Britain, Paul was also an outstanding member of the PCC for four years. It has always been my ambition to hold a full meeting of the PCC outside London. It is vital to get over the message that we are not a body shut away inside a metropolitan bubble, dealing with the complaints of celebrities, royals (and near-royals), and politicians. The reality is far different. We exist for all the citizens of the United Kingdom; and of the thousands who come to us for help and advice, over 90 per cent lay no claim to celebrity whatsoever. So, tomorrow’s meeting of the PCC is an historic moment in the 17-year life of our organisation. My colleagues from the board, all/most of whom are present tonight, are the people who take the decisions under the Code of Practice: about where the public interest meets the individual’s right to privacy; what constitutes a significant inaccuracy; when payments for information can be made – in short, on how the UK’s newspapers and magazines should gather and report news in print and online. This entry was posted in Events, Press freedom and ethics and tagged BBC Trust, Britain, Chair, Christopher Meyer, City Inn, director, European Commission, government minister, Greater London, Heather Mills, internet content, London, Manchester, Manchester Art Gallery, Manchester-based Daily, Media and Sport, media content regulation, media convergence, media lawyers, on-line journalism, on-line publishing, online developments, Online Journalism, Paul Horrocks, PCC, Peta Buscombe, Press Complaints Commission, privacy case law, privacy law, respective case law, Select Committee on Culture, the Manchester Evening News, the Press Complaints Commission, Tim Toulmin, United Kingdom, vibrant media on November 24, 2008 by Judith Townend. 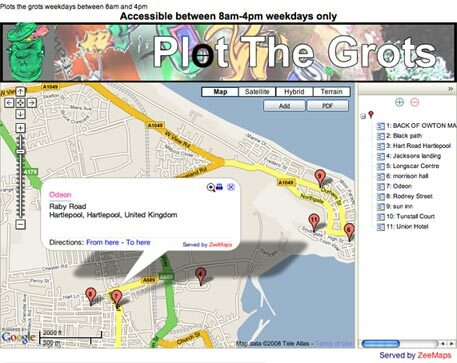 The Hartlepool Mail is using two interactive maps to back its campaigns against potholes and derelict areas of the town. The Plot the Pots and Plot the Grots maps let users flag up of potholes in need of repair and streets and buildings requiring attention. Readers can also submit photos and update the maps when problems have been fixed. Also worthy of note is that the newspaper’s site carries the Press Complaints Commission (PCC) kitemark-like logo and provides links for submitting complaints to the editor. Looking through the paper’s sister sites, this seems to be a common feature across Johnston Press sites – though not common to all news publishers as requested by PCC chairman Sir Christopher Meyer last year. This entry was posted in Newspapers and tagged chairman, Christopher Meyer, editor, Hartlepool Mail, Johnston Press, Mapping, Press Complaints Commission, The Hartlepool Mail, the Press Complaints Commission on March 6, 2008 by Laura Oliver. While yesterday’s meeting of the House of Lords Communications Committee was less of a nostalgia trip than last week’s session, it seems uncertain what value the evidence given can be to the Lords’ review of media ownership. First up was Sir Christopher Meyer, chairman of the Press Complaints Commission (PCC). Having asked Meyer to explain what the PCC does – and test this out with a few case studies – the moment was ripe for some questions on how the PCC is coping with regulating newspapers online and their video content. Unfortunately, no such probing was done – as with previous sessions of the committee, the internet was referred to briefly and then dismissed. The review is meant to investigate trends in the ‘provision of news’, so why is little mention of online media being made? The evidence given last week, where ex-Times editor Simon Jenkins described blogs as ‘bar room chats’ despite being a contributing blogger himself to The Huffington Post, was a case in point example of the committee’s grasp of the digital aspect of the newspaper industry. Jenkins’ comments were met with agreeing nods and laughter and a rehashing of ex-editor’s anecdotes was quickly resumed by speaker and panel. As a current editor, hearing Rebekah Wade’s evidence was more pertinent than reviewing days gone by with previous employees, who can only offer their perspective on a paper or proprietor with whom they no longer have a connection. In between attacking the Daily Mail’s content and recycling paragraphs from his diary, Alistair Campbell did his best to point this out to the panel. They could ask him his opinions on specific events and people, but they would remain just that – opinions, he admitted, often based on the personal likes or dislikes that are part of everyone’s character. When the review reaches a conclusion – and there’s still some time to go – the amount of real insights presented, as opposed to historical overview and personal reflection, are likely to be scarce if the committee’s questions and subjects continue looking backwards and not forwards. This entry was posted in Journalism, Newspapers, Online Journalism and tagged chairman, Christopher Meyer, current editor, editor, ex-Times editor, House of Lords Communications Committee, media ownership, of Lords Communications Committee, online media, Politics, Press Complaints Commission, proprietor, Rebekah Wade, Simon Jenkins, speaker, The Daily Mail, The Huffington Post, the Press Complaints Commission on January 31, 2008 by Laura Oliver.